Let me first of all congratulate you, Mr. President, on your election to the presidency of the 68th session of the UN General Assembly. We wish you every success and we assure you of our fullest co-operation. At a time when the world is facing multiple challenges, there is renewed attention on the role of the United Nations in advancing international peace, security and prosperity. However, never has scepticism about the UN’s capacity to do so been higher, or the external environment less propitious for multilateralism. Nearly seven decades of the work of the United Nations hold one simple lesson and that is this: we are most successful when we adhere to the letter and spirit of the United Nations Charter, basing our decisions on the widest possible consent and balancing equitably the needs and responsibilities of nations at different stages of development. In these seven decades, the world has changed in fundamental ways. Asia and Africa are independent and resurgent. Countries are now not only more interdependent, but also face new and increasingly complex challenges. For multilateralism to remain relevant and effective in the future, multilateral institutions need to be reformed urgently. The place to begin is right here. The UN Security Council must be reformed and restructured to reflect current political realities. More developing countries should be included as both permanent and non-permanent members. Multilateral Financial Institutions should also enable an enhanced voice for developing countries in their decision making structures. Multilateral efforts must guide our quest for peace and security, wherever they are threatened. And the centrality and contribution of the UN system to development must be restored. These objectives, Mr. President, require the building of a new international consensus, suited to our time and rooted in today’s realities. It is only such a plan of action that will enable the UN to meet the twin tests of legitimacy and effectiveness and efficiency. We commend your choice for the theme of this session. Setting the stage for the post-2015 Development Agenda is especially important as we deal with a lingering global economic slowdown and continuing volatility in financial markets. These have imposed disproportionately heavy costs on developing countries and vulnerable groups within them. Growth and inclusive development are naturally important for all our countries. They require a supportive international economic environment, enhanced investment flows, including from multilateral development banks, transfer of technology, and an open multilateral trading regime. But the problems of over a billion people living in abject poverty around the world need to be attacked more directly. Poverty remains a major political and economic challenge and its eradication requires special attention and a new collective thrust. This priority should anchor the post-2015 Development Agenda, which should be shaped by the member states so that it enjoys the broadest possible support and acceptance. Issues of peace, security, human rights and governance are important and need to be addressed. But we will fall short of realizing an ambitious post-2015 development agenda if we focus merely on governance issues at the cost of robust economic growth. This agenda should not be merely about reprioritizing domestic spending, but also about fostering genuine international partnership between the developing and developed countries to bring about change. All of us need the policy space necessary to set our own domestic priorities. No one knows the condition of developing countries better than the developing countries themselves. It is, therefore, important that the UN set clear and concise goals and provide practical and well-defined means of implementation, including adequate flow of resources and transfer of technology, taking the views of developing countries fully into account. A meaningful post-2015 agenda must place equally high priority on food and nutrition, health, education, infrastructure, water, sanitation, energy and discrimination against women. Especially critical is women’s equal access to economic opportunities, and that they do not become victims of violence or targets of prejudice. In India, we have sought to promote inclusive development in multiple ways. Legislation has broadened access to education and secured rural livelihoods. We are now building the world’s largest programme for food security. Digital technology is being harnessed to improve the delivery of public services and benefits to the people. 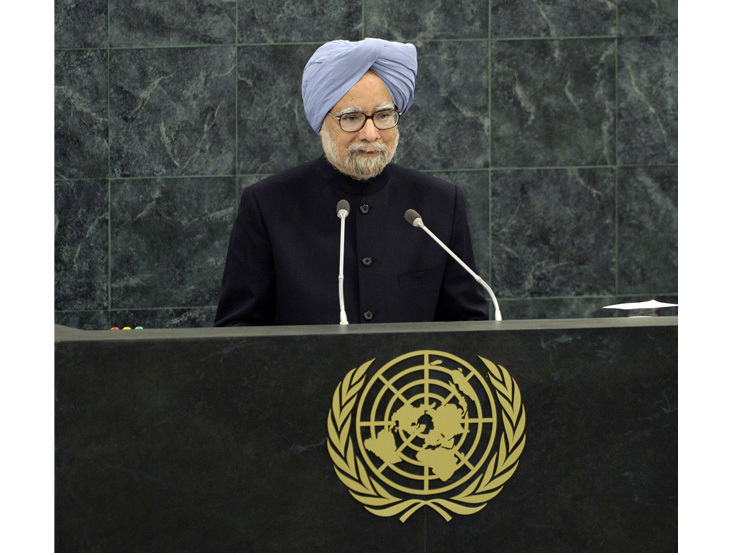 India is proud of its partnerships with developing countries. Using modest resources, we havebuilt strong ties with Africa and the Least Developed Countries. We are committed to building 100 institutions in Africa, have offered capacity building support including thousands of scholarships, and made available concessional assistance of over 9.5 billion US dollars. India and Africa are engaging through the India-Africa Forum Summit process. We also look forward to participating actively in the 3rdConference on the Small Island Developing States in Samoa in 2014 and contributing to its outcome. Climate change is one of the defining challenges of our times.We must summon the necessary political will for crafting a robust global response to climate change on the basis of equity and the principle of common but differentiated responsibilities. We are deeply concerned about the future of West Asia, a region with which India shares deep bonds of history, and one that is critical for our energy security as well as the livelihoods of nearly seven million Indians who work and live in the region. The increasingly lethal conflict in Syria is not only a tragedy for the people of Syria, but also threatens stability and security in the region and beyond. It has been made worse by the use of chemical weapons. The use of chemical weapons, whosoever may have deployed them, must be condemned in the strongest terms. India supports strongly the elimination of chemical weapons material and equipment in Syria. There is no military solution to this conflict. We must intensify efforts to end the conflict and seek a political settlement. It is essential that the Geneva-2 conference be convened at the earliest. We are encouraged that direct talks have resumed between Israel and Palestine. India supports an early realisation of a sovereign, independent, viable and united State of Palestine, with East Jerusalem as its capital, living within secure and recognised borders side-by-side and at peace with Israel. We also remain committed to the Palestinian quest for full membership of the UN. In our own region, Afghanistan prepares for a historic political, security and economic transition. The international community must support the people of Afghanistan through this transition and beyond in combating terrorism, preserving the progress of the past decade and creating a stable, united and prosperous Afghanistan. Terrorism remains a grave threat to security and stability everywhere and extracts a heavy toll of innocent lives around the world. From Africa to Asia, we have seen several manifestations of this menace in the last few days alone. State-sponsored cross-border terrorism is of particular concern to India, also on account of the fact that the epicentre of terrorism in our region is located in our neighbourhood in Pakistan. Speaking from this podium yesterday, Prime Minister Nawaz Sharif of Pakistan spoke of making a new beginning. I reciprocate his sentiments and am looking forward to meeting him tomorrow. India is committed sincerely to resolving all issues with Pakistan, including the issue of Jammu and Kashmir, through bilateral dialogue on the basis of the Shimla Agreement. However, for progress to be made, it is imperative that the territory of Pakistan and the areas under its control are not utilized for aiding and abetting terrorism directed against India. It is equally important that the terrorist machinery that draws its sustenance from Pakistan be shut down. There must be a clear understanding of the fact Jammu and Kashmir is an integral part of India and that there can never, ever, be a compromise with the unity and territorial integrity of India. We need to renew our commitment, especially here at the UN, for concerted, cohesive and continuing global action against terrorism. There can be no tolerance for states sheltering, arming, training or financing terrorists. Nor can they absolve themselves of the responsibility to prevent their territories from being used to launch acts of terrorism. The increasingly complex challenges to international peace and security require a new international consensus to be built, whether it is in cyber security, non proliferation or terrorism. This year, 25 years after Prime Minister Rajiv Gandhi put forward a comprehensive Action Plan for a Nuclear Weapon-free and Non-violent World Order, we must strengthen efforts against nuclear proliferation and pursue time-bound, universal, non-discriminatory, phased and verifiable nuclear disarmament. We must also guard against terrorists and non-state actors gaining access to sensitive materials and technologies. Two years from now, the United Nations will be seventy years old. Every new state that was born during this period took its place in this Assembly not just with pride but also with hope. 2015 will be a moment to celebrate our successes and to ensure that the UN is ready for this century by completing the much needed reforms of the United Nations and its Security Council, by developing an ambitious and balanced post-2015 Development Agenda and by demonstrating our capacity to cooperate effectively for durable peace and security in this world.